Shades of F. Scott Fitzgerald roam Princeton as lads and lasses walk the well-clipped paths between venerable university halls, while russet leaves flutter overhead from rows of sturdy trees. Visions of knights and their fair maidens come to mind as explorers wander around Lambert Castle, an 1892 sandstone and granite mansion that looms like a medieval fortress with rounded towers and turrets on a hillside below the cliffs of the Garret Mountain Reservation. For art lovers who like to stroll on lush lawns and enjoy the beauty around them, Grounds for Sculpture is the place to be seen in New Jersey. And, then there's always the 127 miles of beach along the state's east coast that make perfect day trips for swimming, boating, fishing, and other fun activities. Now in a revised and expanded 12th edition, New Jersey Day Trips offers everyone a fascinating journey through hundreds of tourist attractions in all corners of the Garden State. Plus, this comprehensive resource explores the most popular points just beyond the state's borders. 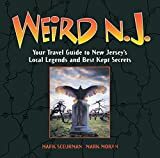 Patrick Sarver has updated most entries and added more than twenty new points of interest to an already extensive list of destinations, making this the most sought-after guidebook about New Jersey. Attractions can be located easily by subject category, letting travelers zero in on places that appeal to them. Entries include descriptions, hours of operation, location, price range, telephone numbers, and Web sites, making this best seller a one-stop source of discovery for day trippers of all ages--an ideal travel guide for adults or families who live in or plan to visit New Jersey..
Make bird watching in New Jersey even more enjoyable! With Stan Tekiela's famous field guide, bird identification is simple and informative. There's no need to look through dozens of photos of birds that don't live in New Jersey. This book features 122 species of New Jersey birds, organized by color for ease of use. Do you see a yellow bird and don't know what it is? Go to the yellow section to find out. Fact-filled information, a compare feature, range maps and detailed photographs help to ensure that you positively identify the birds that you see. The NASCLA Contractors Guide to Business, Law and Project Management is organized into three sections. Part 1 focuses on planning and starting your business. This section will help you formulate a business plan, choose a business structure, understand licensing and insurance requirements and gain basic management and marketing skills. Part 2 covers fundamentals you will need to know in order to operate a successful construction business. This section covers estimating, contract management, scheduling, project management, safety and environmental responsibilities, and building good relationships with employees, subcontractors, and customers. Part 3 provides valuable information to assist you in running the administrative funtions of your business. Financial management, tax basics, and lien laws are covered. Effective management of these areas of business is vital and can cause you serious problems if you do not give them proper attention. Cape May in southern New Jersey hosts one of the world's most prominent birding events, The World Series of Birding. The Garden State is the permanent or migratory home of 465 species of birds, including the state bird, the American goldfinch. This beautifully illustrated guide highlights over 140 familiar and unique species and includes an ecoregion map featuring prominent bird-viewing areas. Laminated for durability, this lightweight, pocket-sized folding guide is an excellent source of portable information and ideal for field use by visitors and residents alike. Made in the USA. A true guidebook that includes deft descriptions, admission prices, hours, and locations of a wide range of destinations. New write-ups for the 9th edition include the Hurricane Harbor waterpark (a new section of Six Flags/Great Adventure), the Crayola Factory in Easton, Pennsylvania and the Yogi Berra Museum in Montclair (hey, it ain't over, til it's over!). Also Mountain Creek, the new incarnation of the old Action Park/Vernon Valley ski area, The Vietnam Era Educational Center (a handsomely done museum created by the same team that did the Holocaust Museum in Washington,D.C.) and lots of listings of county as well as state parks. The book is sectioned by subject (zoos, museums, great mansions, restored villages, the great outdoors, quaint towns, gardens, outlets and flea markets, etc.) and indexed alphabetically so you can always find what you are looking for. Try finding "The Spirit of New Jersey" (it's a boat) in any other Jersey guidebook.